A few months ago at Otakon, I was talking with Alain from the Reverse Thieves, who had attended a panel about magical girls and feminism. He had described how the presenter went through the various series she’d be discussing, but made specific mention that she’d be omitting Precure from the discussion, citing the fact that she wasn’t particularly impressed. Although I did not attend the panel myself, I found that to be unfortunate, not because of the dismissal of Precure by the presenter in isolation, but because this stance on the long-running magical girl franchise is not that uncommon. Among many fans, presenters, and even scholars, Precure is assumed to be bland and generic and not worth discussion. In my opinion, that kind of thinking is a mistake. Precure is not only the biggest and most popular magical girl property of the past ten years, eclipsing even Sailor Moon in certain ways (sales, longevity on TV, etc.) and therefore worth observing for its cultural footprint, but it is also a fount of positive imagery for girls. While there are certain elements that can remain issues, such as the increasing ubiquity of pink as the only possible color for the main heroine and the fact that a lot of the magical girl outfits have high heels, Precure utilizes strong female characters by default, rather than making a big deal out of their existence. What’s more, because the series refreshes itself every year or two, its variety results in different approaches to characterization of female characters and themes pertaining to feminism. You have weak girls who become strong over time (as well as a nuanced exploration of what it means to grow), heroines who are more ideals of human potential, and even characters who try to reclaim the term “princess” to mean something more than “demure.” Even the very first series is significant due to its portrayal of girls having aggressive, hand to hand fights (in a show for young girls, no less), and the fact that its two main characters are more about their life goals than pining at the boys around them. I have my suspicions as to why Precure has ended up with this reputation, and a lot of it has to do with Sailor Moon. 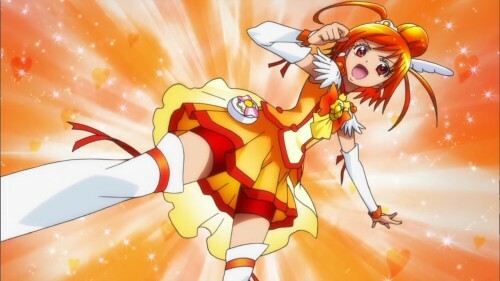 It was the first of its kind, the sentai-inspired battling magical girl genre of which Precure is a part. In terms of cultural influence around the world, Sailor Moon has crossed the barrier from niche interest for anime fans only to seminal work, and is frequently cited as a pivotal show in the development of many young artists. Just the fact that it portrays these mature-looking girls who fight and win is on a basic level empowering and inspiring, and so any similar series gets compared not only to Sailor Moon but also its presence as a kind of nostalgic defining moment where any weaknesses it possesses as a series are forgiven. It’s also very important to point out that, especially in the US, Precure is just plain hard to come by. As a result, for English speakers it has much less potential of becoming part of the fabric of one’s upbringing, with the possible exception of Smile Precure!, which has been loosely adapted to become Glitter Force on Netflix. I get the feeling that, when the Sailor Moon generation typically sees Precure, a common process occurs. First, they see that Precure is similar, and that its story (depending on which version they watch) is often more lighthearted initially. Second, they see that the character designs are younger-looking, and so it seems less mature as well. Third, they might do a bit of research and become aware that the franchise is also popular with adult men, lending a sort of “creepy pervert” vibe to their impressions. Finally, they fill in the blanks, and without watching much more, jump to the conclusion that the franchise can’t possibly do things so differently from Sailor Moon that it’d be worth looking into more, or that it’s only for sad otaku (unaware that Sailor Moon was the show for doujinshi in its heyday). Moreover, because Precure doesn’t have the more immediately apparent dark appeal of a Revolutionary Girl Utena or a Madoka Magica, it’s further assumed to be generic kiddie fare. That’s not to say that the series isn’t for children, but that the type of maturity it carries is more in how it approaches the task of trying to show strong images for a female audience. As discussed above, I believe Precure does this to great success, and to see it brushed aside saddens and angers me. I like Sailor Moon, and I don’t mean to paint fans of that series with the same brush. However, because it is a defining magical girl show for a lot of people, it gets written about as if it is the be-all, end-all of its particular brand of mahou shoujo. The reputation of Sailor Moon surpasses what is actually in the series in a certain way, and it casts an unfair shadow on Precure when Precure does many things that I would argue are improvements or directions that Sailor Moon never goes. This is especially the case with its feminist qualities. My hope is that, when people think about progressive portrayals in anime and the magical girl genre, they not only remember that Precure exists, but are aware of all that it offers. This entry was posted in anime, mahou shoujo, pretty cure and tagged magical girls, precure, sailor moon, strong female characters. Bookmark the permalink. Like you said, I think the main thing is that hardly anybody in the U.S. has seen Precure. It’s hard for anybody to really talk up or get excited about series that has multiple seasons and settings that is not (well, now hardly) available. If I could only watch one, should I watch Sailor Moon or should I watch Precure? I’m asking because I genuinely want to know; I appreciate the historic value of both and would like to watch at least some of one or the other. I read a bit of the Sailor Moon manga for a research project once, but that’s about it. So, which would you recommend I watch given the choice? Keep in mind that there are multiple versions of Precure and that they can differ pretty significantly. Also, it depends on what you’re looking for. Because you’ve already read some of the Sailor Moon manga I think it’d be worth your while to check out Precure, even though the Sailor Moon anime differs in a lot of ways from its manga counterpart. The first Precure series is interesting because it’s fairly unrefined, and carries a certain appeal as a result. If you want the best of the best, I recommend Heartcatch Precure, which I think is one of the best anime made, period. As a warning, if might actually make the rest of Precure feel much worse by comparison.